On Saturday I will have had my 30D for exactly four years. In those four years the camera has done 27,773 exposures, or 19 clicks a day on average. Kept 10,668 original raws and jpegs, which means I did 2.6 clicks for each kept photo. Taken 2,724 (25,5%) vertical shots and 7,944 (74,5%) horizontal shots. Someone asked me, at the photography course last week, what I usually photograph. I’m always stumped by that question and never have a good answer. But now I do. 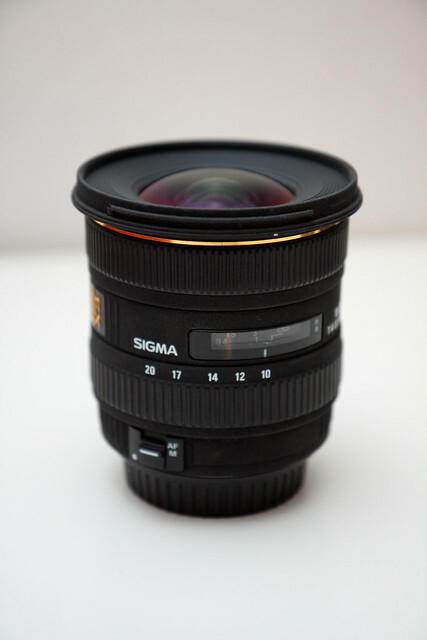 My workhorse has obviously been the Sigma 17-70mm, and it has served me well. In January I got a second hand Canon 17-55mm IS and sold the Sigma. The last two lenses in the table belong to a friend, I just tried them once. Tomorrow (Friday) there’s a guy coming over who is interested in buying the 30D. This camera has a lot of life left in it, so whoever gets it I’m sure they’ll have plenty of fun with it. Camera user setting – lets you change the C1/C2 modes. Judging from experience, once I’ve got everything set up I will rarely change any settings other than those. I’ve also set the Func button to access exposure bracketing. On the 30D I would have had to use the menu to get at this. Here are some things I noticed about the 50D. Perhaps the slightly shorter shutter lag time (59ms vs 65ms) adds to the feeling of speed. Even so, that makes a total of only 16ms less time (from full press to open viewfinder again) and I didn’t know it was humanly possible to detect those kinds of minimal time values. As someone put it in a forum thread somewhere, if the 30D feels like a brick, the 50D feels slightly like a hollow brick. It stil feels very well built, but just slightly more plasticky and electronic and less metal and camera . Which is strange considering it is slightly heavier, 740 grams vs 700 grams. 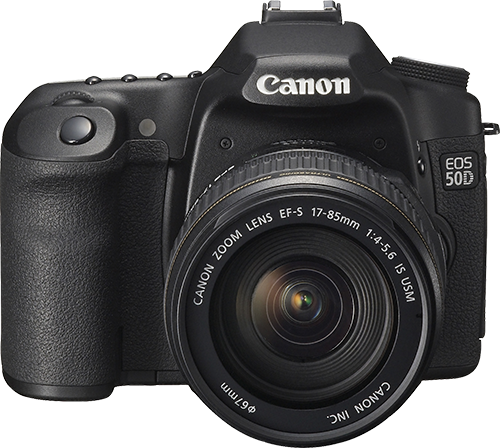 The 50D has a coarse, grainy finish while the 30D’s body is smooth. This felt weird at first, but its obviously just a matter of me being used to the 30D. The shutter sound of the 50D is quite different from the sound of the 30D’s shutter. It is hard to describe in words, but I’d say it sounds quicker and more electronic somehow. And it is definitely quieter. The shoulders on the 50D are higher and straighter than those on the 30D. This makes the grip slightly (5mm) taller, which is definitely a good thing. 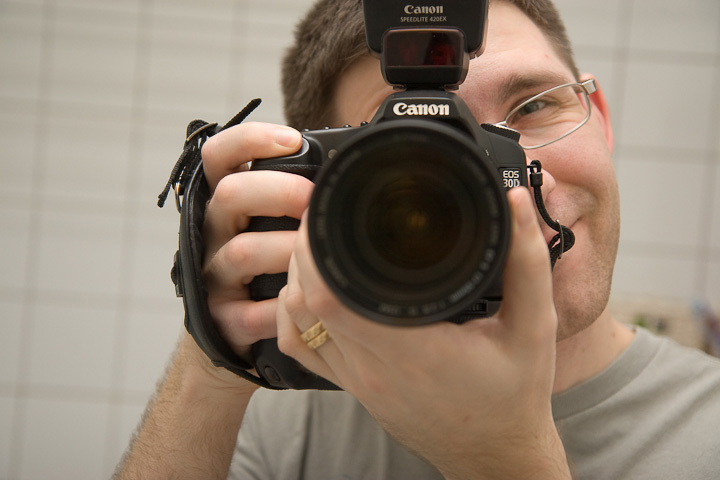 The 50D also has a notch which fits the middle finger perfectly. No big deal, but nice. The functions of the three buttons on top of the camera have been moved around. The new arrangement is more logical, but will take some time for my fingers to learn. I thought the smaller play/delete/info buttons would be harder to press than on the 30D. Actually, I’d say they’re almost easier. The buttons on the 30D are very soft and need to be pushed in quite far. The 50D’s buttons have a more noticeable click and don’t go as far in. The improved screen is very nice. The fact that the preview JPEGs that are included in the RAW files now are full size means that you actually can determine sharpness/focus in-camera. On the 30D a photo could look sharp on the screen, zoomed in. But on the computer there was more detail which showed you a slightly blurry photo. At first I thought my Seagull angle finder didn’t seem to fit the viewfinder on the 50D. But it turned out it was just a bit tight. (In the end I’m not sure it’s any tighter than on the 30D.) I keep the small plastic adapter that sits between the viewfinder and the angle finder on all the time. It protects my glasses from scratches, but doesn’t get them greasy like the standard rubber eye-piece tends to do. All in all, I’m very happy with the 50D. After a week I already feel at home with the very slightly different controls. Today I put my ad up for the 30D [swe]. Side note: Sometimes I get the question why I put my camera down sideways. Simply because it puts the least strain on the front of the lens that way (when the battery grip is mounted). Edit: This post was previously published in Swedish. 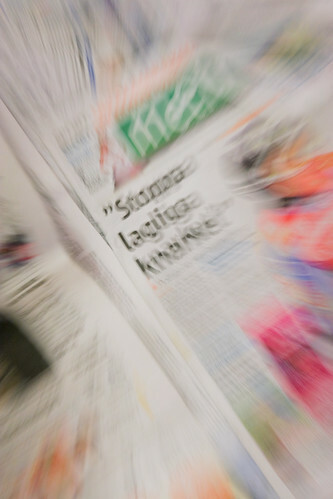 At the time I was thinking of blogging more in Swedish. I’ve now decided to stick to English, so for the sake of continuity I translated this post. When I bought my 30D I was convinced that I would use it until it disintegrated in my hands. Now I’m not at all as sure. 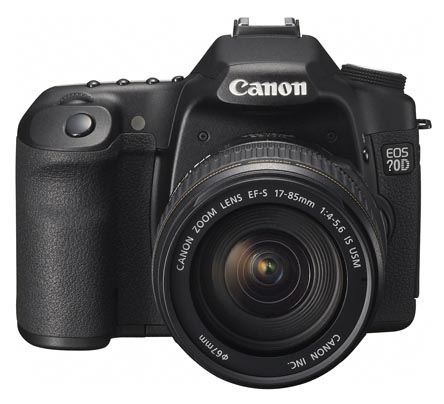 Canon’s 50D has become very very cheap. You can get it new for 6,999 SEK, compared to the at least 12,000 SEK it cost when it was released in 2008. At the same time, I believe I should be able to get at least 2,500 SEK for my 30D if I sell it now. Auto-ISO. The camera automatically chooses the ISO for you. One thing less to think about. Live view. Use the screen to frame your photos. Should be great for macros, landscapes on tripod and shooting over a crowd. Better screen. 640×480 pixels instead of 320×240. Higher resolution sensor. 15 megapixels catches the details far better than 8. Have a look at this well-done comparison of prints. Better auto focus. I seldom shoot things that move particularly quickly, but it can’t hurt to have nine cross-type sensors instead of one. C1/C2 modes. Lets you save two complete sets of all the camera’s settings for quick access in particular situations. I will probably have one setup for continuous AF and 6 fps, the other for single shot AF and single frame burst. Mirror lock-up can also be saved to one of the C modes. ISO in the viewfinder. Nice to always see what ISO speed the camera is set to (or which ISO speed the camera wants to use in auto-ISO) without taking your eye from the viewfinder. Slightly larger viewfinder. The magnification in the 50D’s viewfinder is 0,95x compared to 0,90x in the 30D’s. At the same time I’m trying to sell some old camera accessories that I don’t use. So I hope it won’t take too long before I’ve saved up for the price difference between my second hand 30D and a new 50D. By the way, if anyone reading this owns a 50D I wonder if you could check something for me. Does auto-ISO work respect custom function I-2? I.e. does it stick to the full step increments in ISO speed? Driving home from Enköping after looking at a flat for rent I caught site of these Wood Anomones by the road side. (Vitsippor in Swedish.) Found a spot where I could actually stop. There was a rather worrying sign, Danger of tics , where I turned off. Which obviously made it feel like stuff was crawling all over my skin even though there wasn’t actually anything there. 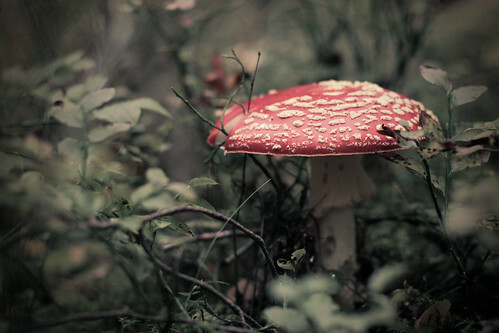 I used my 50mm and my 70-300mm lenses, the latter with the close-up lens 500D attached for a few shots. Overexposed them by 1/3 stop. Set Tone Curve to linear. Applied lens correction vignetting. Amount +100, midpoint 17. The Canon E1 hand strap. A very simple yet extremely practical accessory for your camera. A regular neck strap will work fine as long as your camera and lens both are fairly light. But as soon as you get into heavier stuff it will be very uncomfortable to carry it all with your neck. The camera bounces off your tummy for every step you take. Which is especially uncomfortable if you have a heavy lens on the camera that makes the camera tilt forward. Also, the total weight of the camera and lens will give you a vulture’s neck before the day is over. Alternatively you hang your camera diagonally from shoulder to hip, making it quite a hassle to get it up to eye-level for shooting. The E1 hand strap is a much better solution. It lets you carry your camera in your hand, with almost zero effort. The natural curving of your fingers combined with the hand strap makes it pretty much impossible to drop the camera, even if you relax your hand completely. And that’s with almost two kilograms of camera and lens! It seems to me the hand strap is still quite rare considering how useful it is. Definitely not one of the first things you’ll have heard about from your camera friends after you bought your camera. The Phottix Cleon C8 is a wireless shutter release compatible with many of Canon’s digital SLRs. Mine arrived today so obviously I had to try it out. All the necessary batteries were supplied so it was just a matter of putting them in place. The button on the remote has a half pressed and a fully pressed state which work just as the shutter release on the camera. Halfway down for focusing, all the way down for taking the shot. It seems to work fine for the most part, but in high speed drive mode it always takes at least three frames. No matter how quickly I press the remote it will click through three shots. This is a fun thing to have and allows you to do some weird stuff that isn’t possible with a normal wired remote. I’ll write something about the Seagull Right Angle Finder when I receive the adapters for it (which weren’t included when I first got it). As it is now it won’t fit my 30D. I bought my Canon EOS 30D in the spring 2006 and the shutter still has about 80% of its expected lifetime left, so don’t get me wrong, I really don’t have any plans on upgrading any time soon. My thinking is that spending $1200 on a new camera won’t get me significantly better pictures. Challenging myself and setting up more difficult photo projects might. And that’s more or less free. Anyway, when my 30D finally does give in, I will be well prepared. Pretty soon after I got my 30D I started jotting down stuff I thought would be nice for my next camera. Just so I don’t forget anything when the time comes. Dust reduction. Not sure how effective the current systems are, but most cameras on the market already have this to some degree. Front/back focus adjustment. Again, Canon has already added this to the 50D. Could be useful if the camera auto focus is slightly off. High resolution screen. Three inch, 640×480 screens already seem to be the default so this shouldn’t be a problem. 100% viewfinder coverage. It is so annoying when you think you’ve nailed the composition only to find a twig or some other distraction sticking into the edge of the frame. Remains to be seen if Canon will add this to the cameras in the x0D series. The Nikon D300 already has this so if Canon want to stay in the game they should. Live view with good AF. The current live view systems are so-so. Having to lift the mirror (and black out the live view ) to engage the auto-focus is not good enough. HDMI output. Another feature which seems to have become a standard thing. Multiple shot bracketing. For HDR photography, I want to be able to set the camera to bracket at least 5 or 7 shots. The Nikon D300 can do up to 9, and since this is only a software thing there really is no reason for Canon’s cameras not to have this. RAW in full auto mode. When my wife uses my camera she sets it to full auto mode. This means photos will be saved as JPEGs and not RAWs, which is stupid. I want to be able to adjust white balance and stuff just as much for the photos she takes as I want for my own shots. And again, this is something the 50D now has. 9-10 megapixel small RAW size. The megapixel race doesn’t seem to be ending any time soon. This means huge RAW files every time you want to take a photo. And more noise per pixel. Which in turn increases the file size since it won’t compress as well. So instead of the reasonable ~7 MB per photo that my 30D produces, the 50D for instance produces ~20 MB RAW files. So if Canon wants to keep increasing the resolution, fine, but give us a more reasonable small RAW setting. The 50D offers a 7 megapixel option, but that’s a bit on the small side. Around 10 should be about right. Video mode. I want video recording with good, fast AF and the option of 1080p or 720p. DNG raw files. It would be nice if Canon and Nikon adopted Adobe’s DNG standard for raw files, to make them more future proof . I don’t want to end up with raw files that I can’t open just because the latest version of Windows doesn’t support the software that came with my camera. Wireless flash control. I’d love to have built in support for Canon’s IR wireless flash system. Automatic CA and vignetting correction. Nikon’s D300 analyses the photo and automatically corrects chromatic aberrations. The Canon 50D knows how different (Canon) lenses cause vignetting and can correct this by increasing the brightness of the edges. Both these features would be nice to have in the camera, but most of all I’d like to have them in Lightroom. Does anyone know of any Lightroom plug-ins that can do these things? Since I have four lenses that are only compatible with Canon I’m hoping that there will be a Canon camera sometime in the future with all these features. Maybe it will be the 60D, 70D or 80D? Or maybe they will have started some whole new naming scheme before all these features end up in one camera. Switching to Nikon isn’t really an option anyway. Well, I’m in no rush at all to shell out loads and loads of cash. I have all the time in the world. In the meantime I’m going to enjoy my 30D while I marvel at the many features the camera makers think of in the coming years. Anyway, today when I got home from work I decided to have a go at cleaning the sensor of my beloved Canon 30D. Next I cut open the plastic container for a swab and unscrewed the top of the bottle. Then I set my camera in cleaning mode to expose the sensor. I put five drops of Eclipse on the swab and stuck it in the camera. I did a first swipe, flipped the swab over and did a second swipe in the same direction. I’m quite impressed by how effective this was. All the major dust specks are gone and only a few tiny specks are left on the right side, which is where I lifted the swab. With some practice I will hopefully get even better at this. All in all I’m glad I gave this a go. Finally I can use small apertures without having to do a load of spec-hunting in Lightroom. 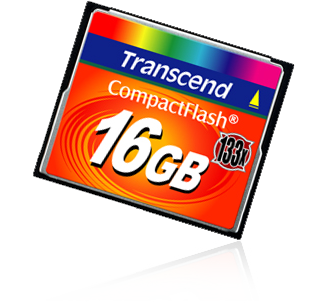 In the spring I bought a 16 GB Transcend Compact Flash card for my camera. I had some problems getting it formatted. But after I did manage to format it, it seemed to be working fine. Until our wedding day. I had lent my camera to Silvana who was doing most of the photography. Everything was working fine until after the ceremony. Suddenly the camera said Data Corrupted . The camera hung when you tried to view certain photos. She came over to me and we switched to one of my old memory cards. I thought it was just one or two photos that were lost. As it turned out, I couldn’t get any photos off the card at all. Viewing the card through Windows Explorer there were loads of files with seemingly random 09f2¤!”%-style filenames. The card size was suddenly claimed to be 248 GB (beat that Pretec). I could see many of the raw image files, but none of them were readable. After doing a bit of hunting around I found Ahlberg Data in Stockholm. The website claimed that data almost always can be saved from hard drives and flash memory. So, hopeful, I sent them my card. It turns out there’s a little processor in the card that deals with the communication between the flash memory units and and the camera/computer. This processor had probably been fried to quote the technician I spoke to. Which means that any data you get off the card will be complete gobbledygook. So they couldn’t either get anything usable off the card. You would have to open the card and read directly from the memory units. This would involve manual labour (don’t we all hate it!) and would be very expensive. Also, it would have to be done by a company called IBAS in Norway since Ahlberg Data themselves don’t have the right equipment. But, he claimed, the Russians are building a machine that will be able to read directly from the memory units, bypassing the processor. (With less manual work required, if I got it right.) He said they are planning to buy one of these when they become available — possibly during the autumn. Let this be a lesson to anyone thinking of buying a cheap, large memory card. Please leave a comment if you have had similar problems, I’d be very interested to hear about them. Har skapat ett recept i Lightroom för detta lite ålderdomliga utseende. Gillar det skarpt, även om jag säger det själv. Alla svampbilder finns i en samling på mitt Flickr-konto. Min klasskompis från Sundsvall Emma har på nolltid utvecklats till en grym fotograf. (Kanske har hon alltid varit det?) Dagens favoriter var dessa två tre. I charged them a bit less than I did Länstidningen last time, since they are only printing 500 copies of the book. They said they would send me a couple of copies too. 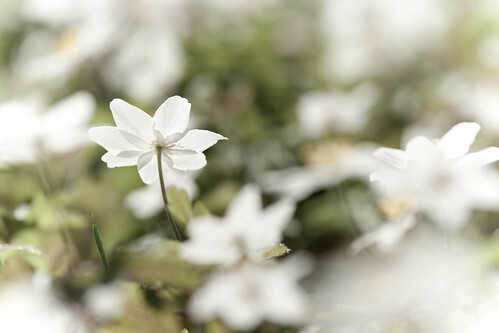 Adobe Lightroom 2 is out. It seems pretty neat with lots of nice new features! What really got me going was reading about the Camera profiles which are meant to reproduce the colours you get straight out of your camera. I tried the camera profile for the EOS 30D with the Faithful picture style. It’s pretty close, but it still renders colours slightly differently. It should be said, this profile is labelled a beta so it might improve for the final release, but I’m not going to hold my breath. ps. I’m now a married man so don’t waste your time on sending love e-mails. Edit: After a few more quick tests, it seems that they have fixed one of my love-to-hate bugs in Lightroom 1: When exporting a JPEG, with all the develop settings at default (0), Lightroom 1.x would still change the colours of the picture slightly. Thankfully that doesn’t seem to be the case with Lightroom 2. I bought the latest issue of Digital Camera (or to be more precise: the Swedish translation DigitalFoto) and found an article on simple macro shots you can take at home. I saw a photo of a match being lit and decided to have a go at cloning the shot. It was difficult getting the exposure right. To begin with I was over-exposing wildly and I had to go as far down as 1/1000th at f/8, ISO 200 before I got it right. I had no idea that a match was so bright — that’s brighter than a clear blue sky or at least roughly the same. The weird flame in the second shot is from the match I used to light the upright match, as I was pulling it back. I took the shots against a black background but that really hadn’t been necessary. The matches were so bright that any indoor background would have looked black. For the record I used my EF 70-300mm lens with close-up lens 500D screwed on. The next project on my list is to have a go at weird fruits and vegetables. On the Sunday evening I went out to shoot the old trains I had found one week ago. There was plenty of — er — old stuff to be found. I tried developing this close-up of a buffer both as a colour shot and as black and white. I preferred the black and white version because I think it gives you that heavy clonky metal feel. This old engine was stripped of all the machinery and completely vandalized. It was packed with that eerie feeling of old abandoned places. Not sure what kind of machine that was on the goods wagon. It could have been the engine of the engine, but it really didn’t look like an engine to me. The drivers cabin of the engine was ripped to pieces. All windows were smashed and the seats and instruments were broken. 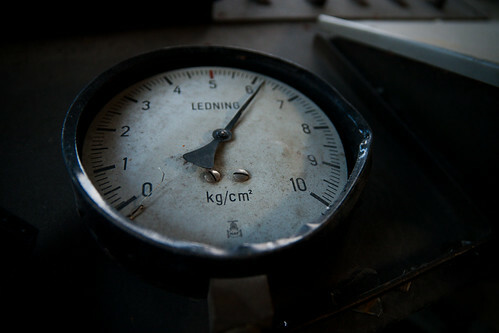 This gauge was broken off and lying on the dashboard. The engines must have been badly isolated. The drivers apparently had electric heaters for their feet. Since most of the subjects were shaded and the light was getting low I underexposed all the shots by one to two stops to avoid the washed out look you otherwise can get in shade. 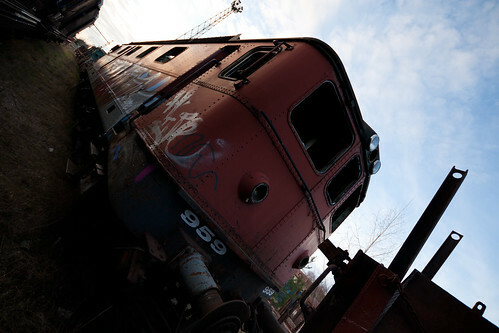 These were only a few of all the shots from the train yard. The rest are in a set at my flickr account. After I bought my new memory card I found several reviews of the card saying it didn’t work properly. So I decided to test mine to see that it works properly. First I filled it with old photos from my archive. No problems. Then I deleted a few, and put it in my camera. I seemed to be able to see all the photos, and I could also take a few shots to fill the remaining space. Finally I put it through a few disk tests. I used the Windows disk check thing and a program called CDCheck. The latter seems to work for any kind of disk. Neither of them found any problems. Today I got the 16GB Compact Flash card that I ordered a few days ago. I just wrote about the crazy weather but this is almost even more insane: 16GB now cost me less than half of what my two 2GB cards cost me two years ago. And back then I had a serious discount since I bought them at the shop I worked at, Allradio. That means that the price per GB is now less than a tenth of what it was two years ago! Eager to try it out (why? don’t know) I put my 16GB card in my camera, formatted it and … Oh! It now only had 8GB of space. It turns out, the Canon EOS 30D doesn’t cope with (formatting) cards larger than 8GB. And when the card had been formatted down to 8GB it couldn’t be reformatted to 16GB. Not in the camera, not in Windows. After hunting around for a while, giving up, and then hunting around some more, I found a solution: A small program called USB_Format. Just unzip it and run it, and it should let you reformat your memory card in your card reader to it’s proper size. Now I just have to remember not to format the card in the camera. But that shouldn’t be so hard. I don’t usually format, I tend to Delete all instead.